What is the PI Function in Excel? 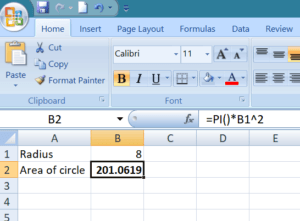 The PI Function in Excel returns the mathematical constant “pi.” To recap, PI is the ratio of a circle’s circumference and its diameter. Often, we would use the PI Function in Excel especially when our business is required to do geometric calculations. These calculations would entail calculating the area of a new office space, a new factory, etc. When a human does a PI calculation, it will approximate PI as 3.14. However, Excel stores the value of PI accurately to 15 digits and up to 14 decimal places. How to do calculations using the PI Function in Excel? To do, this you would first open your Excel spreadsheet. Now input A1 = 8 (radius). Remember the PI function takes no arguments. The PI function, as we all are aware in Excel, stores the value up to 15 decimals. However, as seen above, the answer is only up to four decimals. What happened here was that Excel rounded up the answer to correspond with the cell’s degree of accuracy. We can increase the number of decimal places as required. As shown below, I raised it to 15 decimal places. This was done by going to Home tab > Format button > Format Cells. The Format Cells dialog would by default display the Number tab. Now select Number under the category and then type 14 into the Decimal Places field to use all 14 digits of the constant PI in the formula. Click OK.
For the function’s arguments, you can either enter them directly into the function or define the variables to use instead.